The idea was to put this blog to bed and concentrate on the next film, but luckily things don't always turn out to plan. It seems we have a mini-cine tour on the go. A couple of weeks back I heard about the fishing festival happening in Cumbria in May and thought that might be an interesting opportunity to show our film in a cinema there. Unsure of the technical requirements I called up our local cinema in Uckfield and asked advice from the owner. Not only was Kevin supremely helpful, he even asked the magic question "why not show the film here too?". So up in Cumbria the Alhambra Lonsdale in Penrith agreed to show the film in May as did the Moray Film Festival, and suddenly we had a mini tour. That's great...but lots of work. Hopefully we can get some publicity out there, fill up some seats and some of you reading this may even come along to one of the gigs. We are going to try and be there if we can, so best hone your bun throwing skills now. 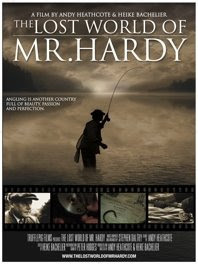 If these showings go well we will soon add more dates as it would be great to make a feature of taking Mr Hardy out on the road.